I initially worked with Gina and Amanda for my invitations, and then wound up using them for everything else for my wedding! What drew me to working with them was the fact that I could do everything for my wedding in one place and I really liked the convenience. Amanda was really responsive to my emails, questions and needs. I always felt taken care of. I put together my seating chart, linens, favors and programs with them all in one sitting! They’re a great team together! Thank you girls for everything you did for me! I can’t wait to put all the pieces together for my big day! Gina and Amanda are amazing!! They helped me with my wedding invitations, napkins and linens for the reception, dinner menus, cake topper, church programs and table cards which all came out perfect and nothing like I have ever seen before! They listened so carefully to everything I said and always had the best advice for me. They have great taste. They are so prompt with all requests and answer emails so quickly! I would recommend going to them for any of your wedding needs from invitations to favors to cake toppers. They offer items in all different price ranges so you will definitely find something unique. They are my favorite of all my wedding vendors, 5 Stars isn’t enough! Planning a wedding is super stressful! Gina makes it fun again. She really listened to our dreams for the wedding and is making them all come true. Her attention to detail is off the charts. I strongly encourage any bride to work with Gina or Amanda at Long Island Wedding Boutique. You won’t regret it! There isn’t enough I can say about Gina and her staff. Always professional, helpful and caring every step of the wedding planning process. Not being from the Long Island area, Gina helped me expedite everything needed to help plan our wedding at Oheka Castle. From the engagement party to the rehearsal dinner, Gina was there to assist with every need! My fiancé and I have been working with Gina on planning our wedding for the past few months and couldn’t be happier with her work!! She has set us up with all of the top people at the best vendors and negotiated great deals for us! I would highly recommend her for any wedding or party planning needs. I absolutely love Gina and Christine. They were so easy to work with and always got back to me in a timely manner. I worked with them for my invitations, save the dates, and candy table. Everything worked out perfecting and I never had any problems. Christine is a doll to work with and so creative. Gina really hooked me up with an amazing deal on my candy table and she made sure there was enough to go around. She even throw in a couple of extra candies and a cute Mr. & Mrs. Sign for my table. My overall experience was amazing! We used Long Island Wedding and Event Planners Boutique for our wedding invitations after meeting with quite a few other shops and vendors. From the moment I walked in, Gina was absolutely wonderful in helping me to design my own custom invitation after showing her a larger invitation that I liked the design on. She took my vision and made a custom invitation that came out stunning and beautiful! 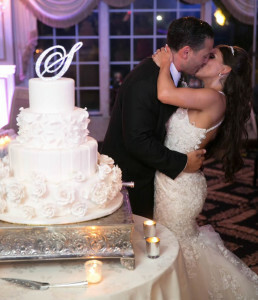 If you want five star service, Long Island Wedding & Event Planners Boutique is the only place to go. I don’t typically take the time to write reviews but Gina & Christine made me feel completely comfortable from the second I walked in the door. They made the entire wedding planning process less stressful. I know I am not an easy person and I look at every little detail in things, but Christine is just as in tune to the details and had nothing but patience with me when I would change my mind on different designs. I have received nothing but compliments on my save the dates and I can’t wait for my guests to see the invitations. I don’t have the time to run around to a bunch of different places which is what’s great about their team. They do it all! My save the dates, invitations, seating cards, menus, programs, rentals, and wedding planning. Their service is second to none and I would give ten stars if I could. I am so happy I found them and I absolutely recommend Gina and Christine to Brides for their wedding needs. Gina and her team were incredible throughout the whole wedding planning process and especially on the big day! I would recommend them to anyone! They helped us immensely to get ready for our wedding and were a joy to work with. On my wedding day, nothing would have been as smooth without their help every step of the way. They are the best! I had the pleasure of working very closely with Christine throughout my wedding planning process. My mother originally met her when she was planning my bridal shower. After a not so pleasant experience at another place, Christine and Long Island Wedding & Event Planners Boutique was just what we needed! After losing my father 10 months before my wedding, it was definitely difficult to try to get myself and my mom back on track. Needless to say, Christine was our backbone! Her upbeat persona and attention to every detail really made us feel at home when working with her. She created the most beautiful invitations, favors/donation card, provided us with sparkly table numbers, our card wedding box, a beautiful decor sign for the dais table, and to die for petal cups and programs for the church! I could never thank Christine and Long Island Wedding & Event Planners enough for giving us the extra boost and care my mom and I needed during our tough time. I can’t wait to work again with this A+ Company for future events! My sincere gratitude and thanks to Christine for making me and my mother feel like we were her up most important priority! !